John F. Flaherty manages and supports the California-based program staff in their work to provide policymakers and practitioners with the information they need to improve education services. He also directs several research projects within the program, ranging from large-scale national policy and program evaluations to local community-based projects, encompassing a variety of evaluation designs as well as content areas. His current projects include the evaluations of the Seattle Public Schools Teacher Incentive Fund (TIF) grant and the Mastery Charter Schools’ TIF grant. In addition, he has served as Project Director for the Charter Schools Program (CSP) Monitoring and Data Collection Project since 2005. Under this long-standing partnership with the CSP and the U. S. Department of Education’s Office of Innovation and Improvement, Flaherty has provided technical assistance to grantees and analytic support to CSP staff to assess the impact of the CSP on the development of high-quality charter schools. 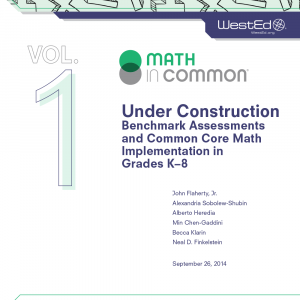 Flaherty completed the Evaluation of the First in Math® Online Mathematics Program in New York City. This experimental study (RCT design), funded by the Institute of Education Sciences, measured the impact of the First in Math (FIM) online mathematics program on student achievement. Flaherty also was an integral part of the WestEd’s early research into the charter school movement in California and nationwide, serving as co-editor of the WestEd publication, Freedom and Innovation in California’s Charter Schools.